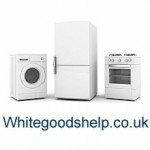 This is a category list of all my articles related to general washing machine problems (not breakdown faults). The articles cover a wide range of issues that can affect most washing machines so it's well worth browsing through them. You might be surprised how interesting or useful some of them are. This is part two of a look at what causes smells from a washing machine and how to get rid of them. The first part looks at problems inside the washing machine (what causes washing machine smells?) but this one looks at smells coming from the plumbing that may be blamed on the washing machine. Black mould is unpleasant, and potentially hazardous to health. It is caused by having conditions where the airborne spores can survive and thrive. It thrives in damp places. Using more hot washes and detergent which contains bleach will help prevent black mould. They also help kill bacteria that can otherwise multiply inside a washing machine. Washing machines now commonly suffer from a build up of a greasy slime and bacteria. Most people should do a regular maintenance wash cycle. Failure to do so usually results in washing machine smells, and a shortened lifespan. It can put dirty marks on your laundry, make clothes smell, and cause various breakdowns and faults. 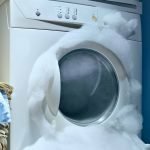 What causes too much foam in the washing machine?